We know how to clean tiles. Here at Clean Carpets Chandler, Tile and Grout cleaning is our specialty! We’ve all done it by hand before. Getting on your hand and knees, scrubbing the tile and grout taking hour upon hours of your time. STOP! No more! We save you time and money with our Rotovac and Grout machines to immaculately clean and sign of grime! Are you getting annoyed looking at your stained grout? Is the dark gout driving you crazy? Let us lift the dirt from it and restore it to how it looked when your tile was first laid down. We tile cleaning Chandler like no one else can! Yes we clean the deepest of deep when it comes to your tile floors and grout. 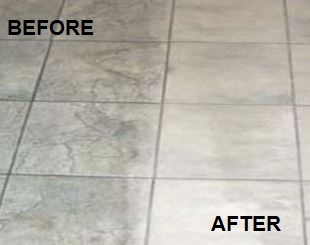 Our tile cleaning machines clean your floors so deep that it lifts up all the dirt you can imagine of the floor. It is amazing. Your tile floors will look like brand new when we are done with them and it will have you calling us back for more every couple months. We guarantee it! ​When you have us clean your tile professionally it protects it from the elements as it seals the grout as well. If grout and tile, dirt and grime build up is not cleaned or taken care it can create the growth of mold and bacteria causing un-safe environment for you, your kids and your family. Do not take the risk. Please let us know if your tile is black or may be moldy. We take personal health very seriously and strongly recommend that having your tile and grout cleaned on a regular basis is a necessity! Please do not risk damaging your tile and grout by cleaning it yourself with heavy duty chemicals. The biggest thing we see when we visit a customers home is they purchased some heavy duty cleaning agent to clean the grout on their floor and have scrubbed and damaged their tiling and grout. Let us take care of it for you. Please ask about or tile and grout cleaning specials in chandler. Visit our Cleaning Services page to learn more in detail about each of these additional services in detail. Remember look no further when it comes to cleaning your floors. Clean Carpets Chandler is your go to source for all your tile cleaning needs! If you need a grout cleaner in Chandler AZ you are in luck! No one does grout cleaning better than us! We offer deep cleaning and mold removal within your grout lines. You can rest assured that your grout will look like brand new again once we are done cleaning it with our high end deep cleaning grout equipment! Are you wanting to clean your grout yourself? 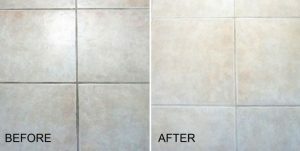 If your knees and back are up to the task you can follow this simple grout cleaning guide! Our cleaners know how to clean any and every type of floor their is. Every employee undergoes a vigorous deep cleaning training on how to restore flooring back to its original state. 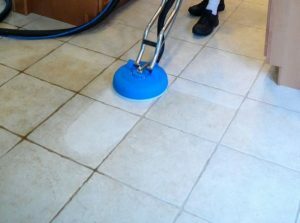 Cleaning Tile in Chandler takes the right cleaning product gentle enough to not ruin the flooring but effective enough to blast away any dirt and grime. Harsh cleaners can ruin your tile so be aware. We take pride in using only neutral and effect chemical cleaners!